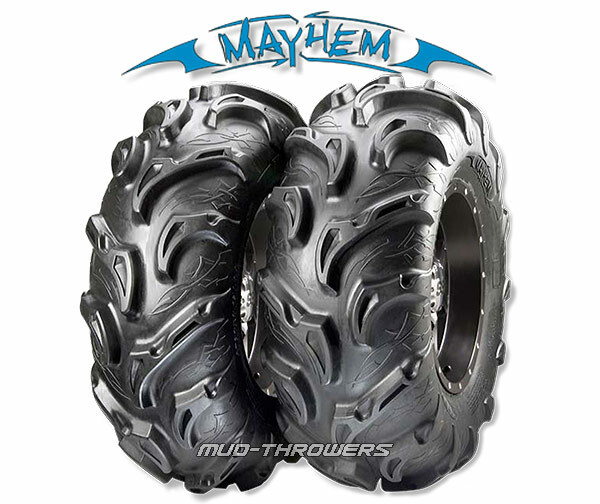 ITP's Mayhem tire is an aggressive mud and trail tire, with striking looks and hard-hitting performance. The Mayhem tire features a unique, deep-lug tread design that mocks the nastiest mud holes but still plays nice on harder trail surfaces. Exceptional acceleration and braking characteristic as well as balanced cornering qualities make the Mayhem a capable, confident all-around performer. With its extended wear rubber compound and durable 6-ply rating, the Mayhem can take a beating and come back for more! With it's distinctive, tribal-inspired, embossed artwork, the ITP Mayhem stands out in a crowd!